The first prototype in the series of works which take images photographed directly from the space in which they are to be exhibited, and are meant to be shown back in the same place where they are made. 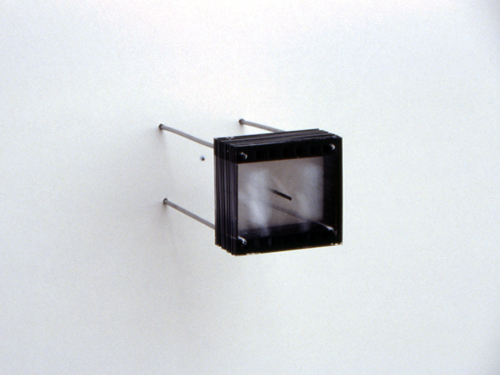 In this case, the "image" seen is a pin-hole, made in the wall of the gallery and which has been photographed 24 times. The images are transferred onto a thick, clear plastic, then placed in their original chronological order in a stack, so that the dot of the hole becomes a line, stretching backwards towards the wall and eventually the original pin-prick.